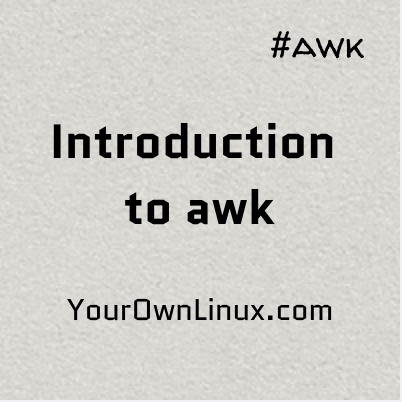 AWK Programming Tutorial - Introduction to awk ~ Your Own Linux..! Interpret a text file as a SQL database and process fields and records. 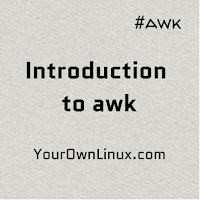 With the power and range that awk offers us, we can replace an entire shell script with an awk single liner. awk and sed, both of them work in a similar way. Run instructions from the script on the buffered (or copied) input line. This won't actually change the original input line. Replace the original data with processed data (in case of sed). It then matches the pattern against the line. If there is no match, current instruction is skipped and next one is picked up. If a match is found, instruction is executed on the line. Once all the instructions are executed on the current line, the cycle repeats for the all other lines from the input file. As soon as all instructions are executed on the current line, sed prints the output. However, awk's behaviour is a bit different, as the subsequent instructions in the script control further processing on the line. The awk instructions in the script file have the same components we discussed earlier - pattern and process. The later component is a bit more complex than that in sed, as it will have variables, conditionals, loops, functions etc. awk works better on a structured data, so it considers each line from input file(s) as a record. Being a structured data, each line will have strings/words delimited or separated by spaces or tabs or some character (comma in case of CSV files). awk interprets each of those strings/words as a field. We can reference these fields using their column numbers as $1, $2, $3 and so on, where $1 represents first field from the record, $2 is second field and so on. $0 is used to reference the whole line or record. Lets understand this from below example. Note that, we have not used any pattern here. So the instructions will simply be executed on each and every line from the input file. In the next example, we take a look at using regular expression to process only selected lines (that matches the pattern) from the input file. Consider that, we just need to find the lines that matches the pattern /Ki/ (Remember to include any pattern inside forward slashes). In above example, we have not mentioned any instructions. So, the default instruction is to print every line that matches the pattern. In the next example, we will use both pattern and the instruction. Lets's say, we want to extract the marks from those records that match the pattern /Ki/. Remember, marks is the 3rd field, so we should reference it accordingly. Please put your comments or suggestions in the comments section below and stay tuned for more articles on Awesome awk!